In hairdresser Ursula Goff's Wichita, Kansas salon, hair styling is a work of art. 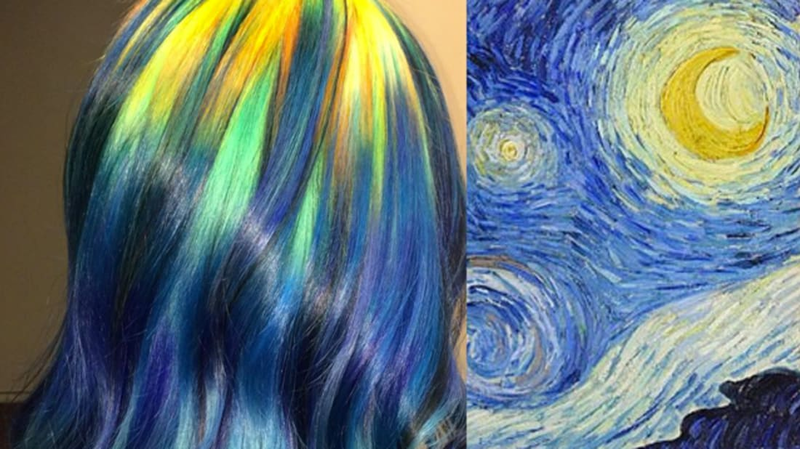 When coloring her clients' hair, Goff draws inspiration from modern and contemporary artwork, using paintings and prints by great artists like Georgia O'Keeffe, Claude Monet, and Gustav Klimt. In each Instagram post, the stylist shows her work beside the inspiration and offers a lengthy art history lesson complete with lesser-known tidbits in the caption. But famous art pieces aren't her only inspirations. "There are often really beautiful colour combinations all around us if we pay attention, and I get a lot of ideas just from looking around – something as simple as a pile of fabric in my sewing area can be enough to get the wheels turning in my head," Goff says. Take a look at some of her work below or head over to her Instagram for more.